I teach. I write. I "dwell in possibility." When Reason Breaks Releases Today!!! This post is also published on the Latin@s in Kid Lit site. Instead of writing something else for my own blog, I am cross-posting it here. Makes sense, right? To celebrate my journey, which started seven years ago, I’m sharing some pictures I took along the way. This first picture represents the writing, revising, and editing phase done alone and then with critique partners. It took me three years to write the draft that I used to query agents. Yes, that’s a long time, but I was working a full-time job and a part-time job, while single-parenting. My writing place is on my bed, and without fail, my dogs–first Rusty (RIP) and now Ozzie–have kept me company. This has been very sweet, except for the times they pawed the keyboard. Notice the guilty look in his eyes. I landed an agent, Laura Langlie, after a few months of querying. I revised based on her feedback, and then the manuscript went out on submission. It stayed out there for a long, long time. We received some valuable feedback after the first round, so I revised again and went back out on submission. Finding the right agent and editor is kind of like literary Match.com. You might go on lots of dates that don’t work, but that’s okay, because the goal is finding the perfect person. So, it took a long time, but the book landed with the perfect person, Mary Kate Castellani at Bloomsbury. This is a picture of the manuscript next to my contract. Receiving the contract is one of those “oh-my-goodness-this-is-happening” moments. At this point, the deal had already been announced online, but seeing the contract in black-and-white makes it real. AHHHHH! ARCs. This was a big moment. I didn’t taken any pictures during revising and copy editing. They wouldn’t have been pretty. But, please know that a lot goes on between the previous picture and this one (major understatement). After revisions, the manuscript went to copy edits. That day was significant because it meant drafting, for the most part, was over. Changes could still be made, but the story moved from creation into production. I received a blurb from the amazing Margarita Engle, and the cover was revealed. Soon after, these beauties arrived at my house. And AHHHHH! 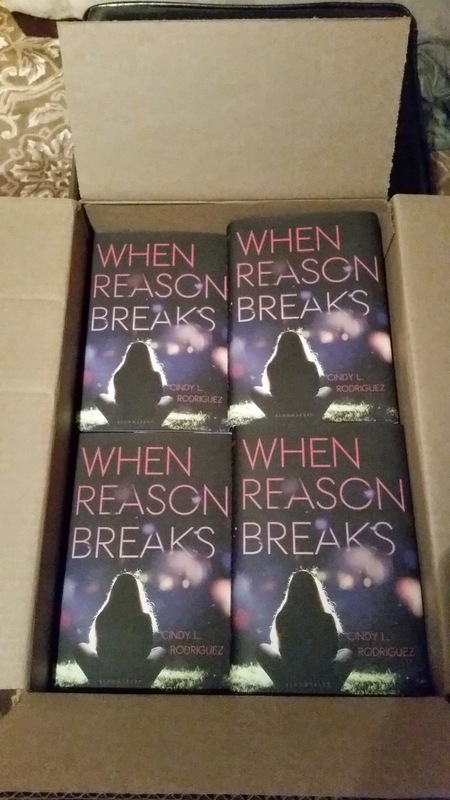 ARCs! Even though I had seen all the pieces–manuscript, blurb, cover art–it was different seeing it all put together in book form. The ARCs went on tour to other authors debuting in 2015, friends, and family. I also gave a couple away on Goodreads. This was the copy that went to the first winner, Ali. 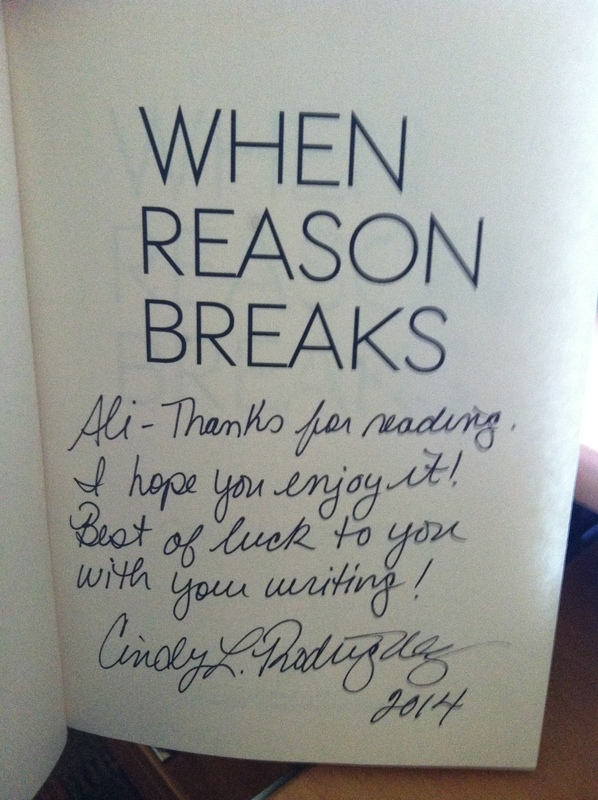 I have signed thousands of things, but this was the first time I signed a copy of my novel. Around this time, the book was listed on Goodreads, Amazon, Barnes & Noble, and other places and became available for pre-order. Holy wow! And people were actually reading the book, which, of course, was always the goal, but as ARCs went out and reviews popped up, I became aware that what had once belonged to me–what had only existed in my head and heart–was really out in the world. Here is photographic evidence of actual reading going on. Now that ARCs were out in the world, I considered ways to help market the novel. One thing I learned from other authors was that I had to do my part when it came to marketing. I didn’t go overboard with swag. I decided to create a book trailer and print book marks and postcards with a QR code linked to the book trailer. The book trailer was a fun, family experience. My sister’s dining room table was the work station, with my nephew–a high school freshman–doing all of the real tech work. He’s a genius with computers, so he handled putting it all together. The opening voice belongs is my niece, and I narrate the rest of it, although my voice was altered to be lower and much cooler, in my opinion. Bookmarks have been distributed to teachers, librarians, and bloggers. Postcards went to high schools, public libraries, and independent bookstores in Connecticut, in addition to some libraries and bookstores in other parts of the country. Writers always question “what works,” and I think the answer is different for each of us. Bookmarks worked for me because I’m a teacher and I have lots of teacher friends who asked for 50-100 at a time. I knew they’d get into the hands of teen readers. Also, I have received some positive feedback from the postcards. A few librarians emailed me saying they received the post card, viewed the trailer, and planned to order the book; some even invited me to participate in events. So, in my mind, these three things were worth it. While the ARCs were “out there,” the manuscript continued to be worked on through copy editing and then first pass pages, which should be called the 100th pass pages because everyone involved had read the manuscript so many times. First pass pages are cool because the manuscript is typeset, rather than being on regular paper in the standard 12-point Times Roman. After the first pass pages were returned to the publisher, the next time I saw my novel, it was in…….. These came earlier than expected, so I was surprised when I found them on my doorstep. My daughter hugged me and said, “Wow, Mom, they’re beautiful. Congratulations.” I might have gotten a little teary eyed. That day, I donated a copy to my local library and then brought copies to my family. My mom cried when she saw it. My mom doesn’t cry easily. I might have gotten a little teary eyed then, too. During this last month before publication, I’ve been excited and nervous and, most of all, grateful. Thank you to everyone who has been involved in this process. It takes a village to write and publish a book, and because of everyone who supported me along the way, I saw my novel on a shelf in Barnes & Noble for the first time this past weekend. Wow! And please look for it at your local libraries. I have a periodic newsletter with the latest information about my books and upcoming events. To subscribe, highlight the entire link below, right click on your mouse, and then click where it says "Go to..." This will take you to the subscription form. YA Scavenger Hunt Spring 2018!